A continually increasing number of industrial applications are being switched from fieldbus technologies over to Ethernet networks. Planners and system designers are therefore facing the challenge of selecting the most suitable network components. In the infrastructure, patch panels help to connect the devices installed in the network simply, safely, and in a structured manner. Patch panels are passive components that link two segments or levels to one another – a solid installation to a stranded one, for instance. In the field of automation, they act as an interface between the internal control cabinet cabling and the network devices installed outside the control cabinet. This enables the point at which the field cabling in the control cabinet will be connected onsite to be defined as early as the system configuration stage. All the components to be included in the control cabinet are preinstalled when it is manufactured. So, when the corresponding system is started up at the end customer’s premises, just the field lines need to be routed. The patch panels are located toward the bottom of the control cabinet, next to the cable entry, so start-up personnel no longer have to open any cable ducts. The internal control cabinet wiring will have already been implemented using pre-assembled patch lines in advance. Thanks to the easy connection of the Ethernet cable to the patch panel, it is possible to do without the complex installation of an RJ45 connector with special tools. During configuration, CAD systems require a unique equipment identification (EI) for every interface and component. The patch panels therefore feature a sufficiently large free space with a marking on their front, where an EI label can be affixed. This enables networks to be created in a structured manner during the configuration phase and is an easy way of ensuring that everything will run smoothly on site. The eight new patch panels offer a variety of different connection technologies, so all users can find the connection method most convenient for them. The easy, fast, and secure installation process is up to 60% faster than when using conventional patch panels, making installation economical. Depending on the version used, the cross-control-cabinet field cabling is simply applied to screw, Push-in, or IDC connection terminal blocks. The Push-in terminal block allows for a more convenient connection compared to the commonly used screw connection technology. The greatest time savings, however, are gained with the IDC fast connection technology. Using this insulation displacement technology, the single wires are no longer stripped; instead, they are just inserted in a slot. The terminal block is then pressed closed with a finger. A colour code printed on the underside of the opened cover enables the wires to be connected in accordance with TIA 568A, TIA 568B, and Profinet. In addition, a line mark is used to indicate the correct sheath stripping length of the cable. The hinged cover is closed after connection. It covers the wiring space on the field cable side with connection terminal blocks and shield contacting, thus creating a uniform installation look. Over and above this visual aspect, the sensitive connection wires are therefore protected from external influences. Connection to the terminal devices is then established using pre-assembled RJ45 patch cables. Due to the fully shielded wiring arrangement of the compact patch bays, the transmission bandwidth is up to 1 Gbps. The extended operating temperature range of -40°C to 75°C means they can be used in many industrial fields. The patch panels from the new PP-RJ product families offer a new type of shield contacting. The cable shielding can be connected without tools, providing strain relief at the same time. A shield contact spring presses the cable with the braided shield folded back over the cable sheath against a contact surface located directly on the conducting path of the circuit board. For this purpose, the cable is placed into the slot and the spring sheet pressed with the finger until it locks into place in the housing. In this way, the cable shielding covers a large surface and the cable is provided with strain relief of up to 50 N. To release the connection, the lock only needs to be levered up with a screwdriver. If the user closes the housing cover with slight pressure after connecting the cable, the shield contacting will not open even during extreme vibration. The shielding is securely and directly connected to ground potential via the DIN rail. It is therefore possible to discharge all interferences occurring on the cable shielding. As the first patch panels for DIN rails, the four PP-RJ versions come with integrated surge protection. Ethernet interfaces operate with low signal levels at high frequencies, which makes them particularly sensitive to surge voltages and the malfunctions caused by them. Surge voltages can also destroy expensive network components. Especially with regard to cabling across several buildings or control cabinets, the devices may be adversely affected by the coupling of voltages, so the new patch panels meet the DIN EN 61643-21 surge protection standard, with IEC test classification C2. The ‘field-side port’ is intended to be used as a surge protection interface. Depending on the version, it is designed either as an RJ45 or a connection terminal block beneath the cover, so the eight signal paths are protected. Thanks to a patented system of shield current monitoring, the new patch panels are also exceptional in applications with Power over Ethernet (PoE). If the installation is characterised by different potential references, this may cause equalisation currents to flow through the cable shielding, which can damage expensive network devices or disrupt communication. To counteract this, the patch panels provide simple diagnostics in cable connections using PoE. Any equalisation currents or coupled currents are measured and indicated via an LED. This process takes its power transmitted by the PoE supply. The LED lights up if the cable shield current exceeds 30 mA. This shows the user that a general grounding issue exists in their entire installation. Individual control cabinets or parts of a building might have been connected improperly with regard to their potentials or there is still a high risk of electromagnetic influences on the cable during installation. 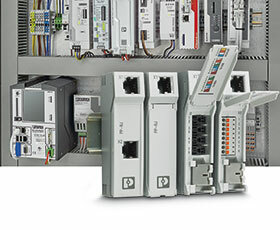 The new Ethernet patch panels from Phoenix Contact allow for quick and easy connections to be made between field cabling and control cabinet cabling. The passive connector panels are a convenient alternative to assembling RJ45 connectors on-site, as there is no longer any need for a laborious installation process using special tools. The eight DIN rail devices support various connection options. Inside a wiring space that is sealed by a cover, and therefore protected, the IDC, screw, or Push-in connection makes installing the field cable so much easier. With strain relief assured at the same time, the cable shielding is connected quickly and without tools, saving a great deal of time. Optional surge protection safeguards the connected terminal devices and ensures a high degree of system availability. Furthermore, repair and downtime costs are avoided, as is the loss of important data. Additional shield current monitoring goes hand in hand with beneficial diagnostics, as an LED indicates the shielding currents produced by different potentials or EMC influences. Thus, the user is informed that there are problems in the installation without the need for extensive measurements. A common strategy required for the future.